I don't remember this getting posted. 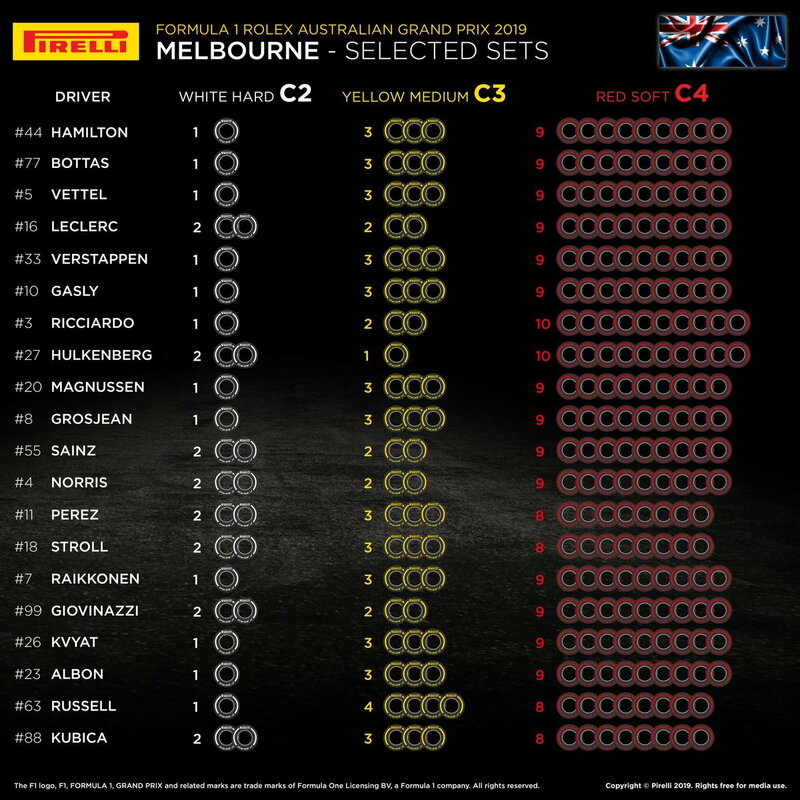 It's the tire choices for Australia. Renault with 10 sets of the softest tires, and Hulk only 1 set of the mediums (which would seem to be the race tire of choice). That seems not ideal, but who knows. Maybe they know something about their car on the C4 that we don't? RPFI and Williams with 8 sets of softest. Williams has such a cash flow problem that it can't pay the ticket plane to Melbourne for Paddy Lowe ! OFFICIAL: Lowe is low, FIRED. "Paddy is taking a leave of absence from the business for personal reasons," Williams' statement said. The press conference to announce the meeting led by Claire without Lowe was already significant, especially when she added that it will be necessary to find the responsibilities. This is a very bad time for a team in agony, Lowe after Rob Smedley, it smells like the end unless the billionaires ''Ruskofs'' and other Mazepin or Sirotkin or Latifi takes the opportunity to jump on the animal ! Who's gonna want to go to Williams' house? Or rather who will be the next to leave ? Williams is so Low ! Le nightmare continues for ***** , juste one week before Melbourne, FIA informed Williams earlier this week that it would have to change the suspension of its FW42 if it wanted to compete in the first GP of the season. I note FIA words 'if it wanted to compete in the first GP...'' , Perhaps Williams doesn't want any more, ***** is tired, Lowe, Smedley, the designer...a lot of retirement. Does Williams even have the cash to revise their suspension? Although I think they've already been working that scam in Russia. It's the same ol' story: to compete in F1, you better have a bank with you. Its very bittersweet for me. I hate Paddy with a passion bcause he is a lying douchebag..
however, I love Williams as a team and would love to see Claire removed from the team and sent into a forced retirement. I truly hope they find the right sponsor/investor to come in and take over the team and steer it in the right direction. Did I mention that Paddy Low is a self entitled ***** and hope he gets demoted to Formula E?? Last edited by D K; 03-07-2019 at 08:52 PM. It's been my observation, EVERYONE in F1 lies. Whenever big $$$ is involved in anything, liars and cheats come out of the woodwork. It's the Way of the World (this year of our Lord, 2019). FIA trying to make the sport better? "The Council approved the launch of a series of tenders within the context of the ongoing development of the 2021 Technical Regulations," they read. Just last month, the FIA invited tenders for a standard gearbox cassette which would be used by all teams from 2021 to 2024, and while no specifics are mentioned in the WMSC's brief statement it is clear that F1 is seeking to standardise more parts. "We need to close the differential between the cars in terms of overall performance," said the sport's technical boss, Ross Brawn at the official screening of the Netflix documentary of the 2018 season. "We have divisions, one and two at the moment, and we need to stop that," he continued. "We need much closer gaps between the teams and cost control will be part of that. The regulations evolving will be part of that. "We are moving a number of elements on the car which don't engage the fans," he said. "Technology should be exciting and fascinating for the fans. That's not things like a lighter fire extinguisher. "Every team wants to build its own fire extinguisher because it thinks it can make it a bit lighter than someone else's," he continued. "No-one is interested in that. That's just a simple example, everyone should run the same fire extinguisher. But if you've got the money to put into the fire extinguisher, you can probably make one a bit lighter than someone else, and where the teams have the resources, and the money, and the budget, they can do those things. "Then they get just a fraction of a second advantage here, and a fraction there, before you know it, they're a second ahead, and the competition is poor," he insisted, this from a man who pushed the envelope to its very limit - and then some - constantly treading that very fine line between the legal and the not so legal in his quest for that little bit extra pace and performance, that edge. "So we have to have cars which are close to each other, and then, when they're close to each other we have to have them behave in a way that they can race each other. "There is a massive difference already. With the current cars, once you are two car lengths behind you lose 50 per cent of performance. "The car we have under development is a huge improvement on that, huge," he said of the work being carried out by his technical team. "It's a commercial approach and a technical approach that will bring a better F1 and so we're doing both in parallel. Everyone would like to see it happening more quickly or more visibly, but when it's done it will be done correctly." Something so simple ended up costing the team millions last year. I'll be pulling for them to give Renault and Alfa Romeo a battle for 4th this year. Completely agree....SOMETHING has to be done. I think the point for fastest lap is a good idea. I would also give 2 points for the fastest qualifier and one point for each of the practice sessions. it would promote teams going all out more often. When teams go all out - maybem ensues. Mayhem = safety cars, yellow and red flags...none are good IMO. I'll be starting this over the weekend. He talks so much ****. Watched a couple episodes of the Netflix F1 series. High quality dig into last season and the personalities. The 4K and the audio is excellent. Sadly, MB and Ferrari's absence in the making of this series is obvious. It's good to know they aren't really interested in promoting the sport...just controlling it. Liberty needs to get those peckerwoods in line with an ultimatum or simply write off the buyout as a bad investment and move on. The worse that can happen is MB will become a powerunit supplier again. And Ferrari can't leave F1 even if their management would like to...the Tifosi won't allow it. Amazing quote in that article (paraphrased): "we'll practice 10-12 pit stops a day". Are you kidding me? We stopped by Hendricks Motorsports 2 years ago, and they were practicing probably 12 pit stops per hour. Yeah, that was a little bit of an eye-raiser. Coincidentally, the first episode of the NF series focuses on what happened with that kerfuffle last season...including the phone call from Steiner to Haas afterwards.